I can't believe it's December 6th already. Christmas will be here before we know it and I'm not nearly ready! Today I have another Valentine Card for you featuring the Heartfelt Love Collection. This will actually be the last post for this collection as we're debuting a beautiful new one next week. Other products: VersaMark, White/Iridescent Ribbon, Heat Tool, Stamping Up Melon Mambo Cardstock, Misti, Big Shot Plus, Hot Glue Gun. Create a side fold 5’ x 7’ card base from Melon Mambo cardstock. Cut a mat layer from the Heartfelt Love paper collection at 4 7/8” x 6 7/8”, distress the edges and adhere to the card base using dries clear adhesive. Cut another mat layer from the Melon Mambo cardstock at 4 5/8” x 5 3/4” and adhere to the base using dries clear adhesive. 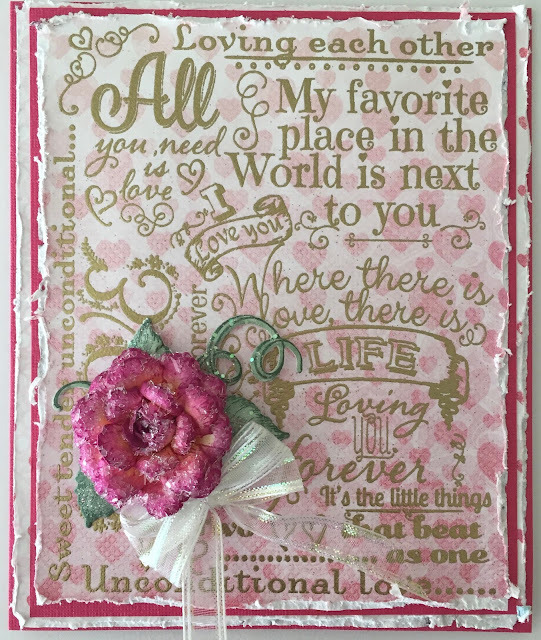 Cut another piece of the designer paper at 5 5/8 x 4 3/4”, stamp the Forever Love Background Stamp with VersaMark ink, sprinkle with gold embossing powder and heat set. Distress the edges and adhere to the card base. Stamp the Classic Roses with Lilac Posies ink, color with lilac posies and cantaloupe ink, diecut using the coordinating die, shape using the deluxe flower shaping kit. Stamp the Leaves with Bamboo Leaves ink, color with Bamboo Leaves and Lilac Posies, diecut using the coordinating die and shape. Sponge the flower and leaves with dries clear adhesive and sprinkle with Rajni Chawla’s Crystal Clear. Adhere to the card base with hot glue gun as shown. Make a small bow and adhere it under the rose. Thank you so much for stopping by...I love reading your comments. Oh Janet, this is stunningly beautiful! And that rose....oh my! Just gorgeous! Your rose with the sheer ribbon in so beautiful and I love your distressed edge on one of your layers too!! Beautiful! Such a pretty card! Hugs!